Настоящим уведомляем Вас о повышении до нашего нынешнего .IT, .FR и .UK (включая все 3 — го уровня поддоменов) Регистрация, обновление и трансфертное ценообразование платы на нашем уровне цен «Basic». Это увеличение поддержки нашей постоянной инвестиции в расширение нашего ассортимента TLD, предлагаемых продуктов и поддержки клиентов в этих регионах. Пожалуйста, обратите внимание, что цены в других валютах, могут быть изменены в связи с колебаниями валютных курсов. Мы приносим извинения за любые неудобства, это увеличение цен может привести, пожалуйста, будьте уверены, что мы по-прежнему намерены продолжать предлагать нашим клиентам самые низкие цены, которые они привыкли ожидать от нас. It is the end of the business year and all of our discounts in December are business themed. .BIZ is a mainstay of the TLD world and continues to offer value to it’s investors. Rarely will you find .BIZ at such a low price and we are unlikely to be allowed to sell it this cheap again. One of the most successful new TLDs, .GLOBAL has managed to carve out a healthy niche through its effective marketing programs and end user adoption. This is a well supported TLD and if you are looking at new TLDs to invest in .GLOBAL is a secure choice to make. An easy choice here, .ONLINE is the TLD of the future. It has mass appeal and a broad range of uses. We are selflessly offering these names for a reduced price of $5.99 to help get you online during the holidays. On Monday the 18th of December we will be updating our internal exchange rates to reflect changes in the external rates. In some cases, this may change the prices that you are charged by us for your orders. We calculate our prices based on the charges to us by each domain Registry, and where these charges are in a different currency to the currency you are billed in, we use our internal exchange rates to calculate our price. For example, the .com domain is build in USD, if you pay for .com's in EUR then we apply the exchange rate. We are confident that the majority of our customers will enjoy better pricing, however for those who do not we apologise in advance for any inconvenience. Please be assured that we remain committed to continuing to offer our customers the low prices they have come to expect from us. 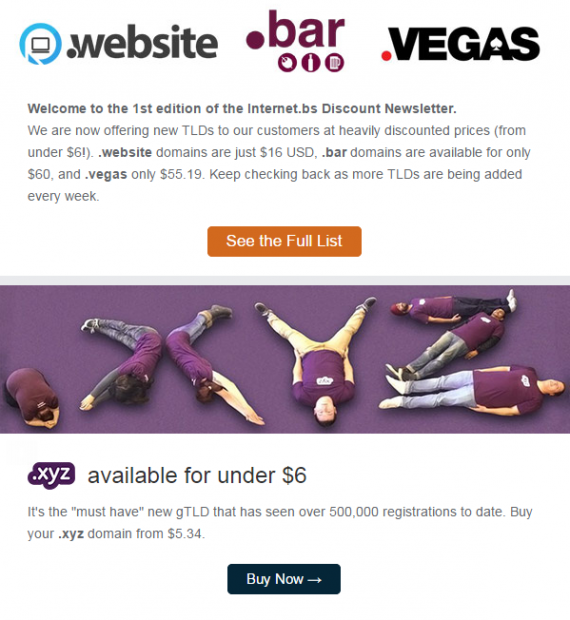 Flash Sale on New TLDs until midnight on Thursday! Forget Cyber Monday, we are kicking things off early with a flash sale on some of the hottest new TLDs. Until Thursday this week (26th) we are offering .Website, .Space and .Site domains for just 99 cents, with .Online and .Tech for just $4.99*. That is a huge saving! The savings don’t stop on Thursday; we are discounting all these TLDs, plus .Host, .Press and .PW until the end of February next year! We write to inform you of some important changes to how we take payment on our site that will start to take effect from Monday the 19th of October. From Monday, we will introduce a new payment option via the Payment gateway provider "WorldPay"; this provider will be our main payment gateway for payments via debit or credit card going forward. Additionally, we are in the process of setting up a US based merchant account through Worldpay so that debit/credit card payments from within the US will not incur foreign transaction fees, as they currently do. Please note that this is still in process, we therefore ask that customers in the US wishing to pay by debit/credit card continue to do so through the Emancipation Media Paypal option. Once we have setup the US based merchant account the Emancipation Media Paypal option will no longer appear and all standard debit/credit card payments can be processed via Worldpay. At that time we will also introduce a direct Paypal option for Paypal payments. Due to a lack of customer demand we will also be removing the Payza payment option at this time. These changes are being made in order to make our payment processing services simpler to use and to allow for the Auto-Renewal of domains for those customers paying via the Worldpay payment option. If you have any questions or concerns about this change, please don't hesitate to contact our customer support team. Please take note that due to recent foreign exchange rate fluctuations it has become necessary for us to review our currently set exchange rates. The base price for each TLD remains unchanged; we have only updated our exchange rates to reflect the current market rates. Therefore some TLDs will become cheaper and others more expensive depending on your chosen payment currency. For example, as .com is a TLD billed to us in USD, all orders for .com placed in EUR or GBP for .com domains are subject to exchange rate fluctuations and may change; the price in USD will remain the same. For the .eu and .it TLDs which are billed to us in EUR, all orders placed in USD or GBP for these TLDs are subject to exchange rate fluctuations and may change. We regret having to make any changes that have an effect on our customers, but from time to time we will need to make adjustments to our exchange rates. We will always notify you in advance ahead of any changes. If you have any questions about the updated exchange rates, please contact customer support.